There are some awesome tiny house plans with loft on the market. Many of these tiny house plans with loft are designed for full-time living. For example, you can purchase or build a tiny house just under 200 sq. feet for a price of $10,000 or less. This incredibly small home will come complete with a full working kitchen. The kitchen will have a full size washer machine, refrigerator, mini oven, micro wave oven, double wide sink, stove top ventilation, and lots of cabinetry and storage. This unique home will also have mechanical ventilation, an office nook, a living room with sofa, a propane fired fireplace, a built in china cabinet, a folding dining room table with 3 chairs, book shelves, and additional storage units. There will be a queen sized bed in the loft with a night table. There is also an option for guest sleeping quarters in the loft area as well. The unit will easily connect to a septic or sewer system. The mini bathroom will have a standard porcelain toilet and porcelain wash basin. The porcelain wash basin will sit on top of a cabinet with additional underneath storage space. There will be a mini bathtub/shower combination with a removable shower head. The entire unit has an overall size of 9’ x 20’ and can be transported and set up on a wheel base. This will allow for extra outside storage under the tiny mobile home. You can use standard shingles for the roof or else you can install a metal roof of any color you prefer. The majority of these tiny home will use vinyl siding. Vinyl Siding has many wonderful colors to choose from. The windows will be double hung, sliding glass windows with optional muntin bars. The exterior doors can be either wood or metal. Many of these tiny home also select a satellite dish for TV reception. Tiny homes are especially suited for narrow building lots. They also have the additional feature of being mobile. If you ever have to relocate you can simply transport your home and all of your belongings simply and easily. The home can remain on its transportation wheel base or you can construct a separate concrete foundation. These type of tiny homes are perfect for country living by a lake or river. Tiny homes do not come with a built-in patio or deck. However, it will be easy to construct a patio or deck once you have positioned your home on your building lot. Many tiny homeowners also construct a freestanding covering for their car or truck. 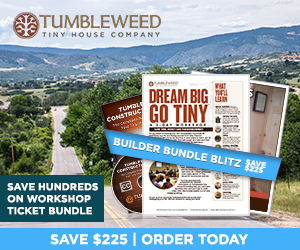 There are many websites that have tiny home building plans for you to see and purchase. You can build a tiny home on your own or else you can purchase a pre-built unit from a reputable manufacture. Whichever way you decide to go it is a fact that you will enjoy the many fine benefits of living in one of these fantastic smaller, well organized tiny homes. I think I would like a tiny home with loft. It would force me to get rid of all the things I have collected over the years that I do not need. The tiny house movement seems to be taking hold. Downsizing to a Tiny Home- What to keep? What to Give Away? Tiny House Movement – is North America the Only Place? Tiny House Insurance – Where Can I Get it?